Tough Jewelry Collection for Mother & Son, to Show your Strong Bond! “This is not Fair” says Daan, my 5 years old son. While my two daughters have a whole collection of jewelry, Daan has nothing at all. And so, I intended to do something towards this, and we designed a Mother & Son jewelry collection. Now, I just enjoy him holding my hand proudly! You and me, lets rock the world! At KAYA, you will find several Mother & Son bracelets. We have .925 silver onyx stone bracelets with silver stars, Tibetan Shamballa bracelets, and “key to my heart” bracelets. All of these bracelets are made of real precious stones such as onyx, blue gold stones, turquoise, and tiger. Thus, you will get a high quality bracelet that lasts. With each bracelet you order from KAYA, you will get a luxurious silk pouch that you can use to present your gift, or you can store your bracelet in it. The Hand-woven Shamballa bracelets come with an easy sliding system, and so the length of the bracelets is adjustable. There is a philosophy behind the Shamballa bracelets, which is that the one who wears the Shamballa bracelets is believed to carry the power of the gems. Onyx: Ancient Egyptians as well as the Romans believed that this stone was a very important protective stone. They believed that this stone gives strength and perseverance to achieve goals. A perfect stone for your cool kids! Turquoise: It is believed, that this hot stone, brings balance and creates inner peace. Blue Goldstone: Contains small glittering from which powerful energy sparkles! It is also known as the stone of wisdom and science and is said that the stone brings good luck. Tiger Eye: is a protective stone that is believed it gives peace. It is said that tiger eye gives you strength, courage, confidence, and insight in difficult situations. Cute round charm with ornate letter. Very stylish to completely finish a baby or child's bracelet. Or ask a mama bracelet with the initials of the children, anything is possible. Make your jewelry completely personal with a silver charm. Say for example 's star is born', 'my dear son "or" baptism in 2014. How to make the bracelet really finished. How special, a charm with a personal message for mom and child. For example, say "dear son" and "Mom ★". Made of black onyx beads with silver balls. A tough persoonljike & gift! 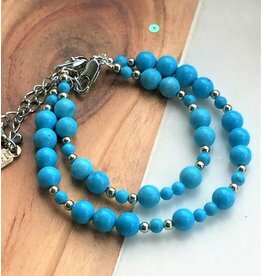 Tough bracelets for you and your child with beautiful turqois gems. So everyone can see that you can go together! Mother & Son Bracelets "See Breeze"
Beautiful in its simplicity, this tough .925 silver bracelets for mother & dochterof bff's. Made of shimmering silver 4mm balls into the 'Tiffany style. These bracelets are designed for tough kids & mom. My son wears the key, the lock mama, how sweet is that? These bracelets are designed for tough kids and mom. Made of black onyx beads with silver balls. The small asterisk says "I love you to the stars and back," how sweet is that? These bracelets are designed for tough kids & mom. Made of black onyx beads with silver balls. The small asterisk says "i love you to the stars and back ', how sweet is that? These bracelets are designed for tough girls and mom. Made of black onyx beads with real .925 silver balls. The little girl carries the key to mom's heart, how sweet is that? These bracelets are designed for tough kids & mom. Made of black onyx beads with genuine .925 silver balls. Silver star says' I love you to the stars and back ", how sweet is that? 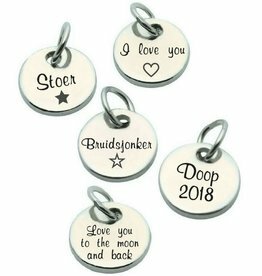 onyx kralen, zilveren bolletjes en symbolische bedeltje. Mama en oma het slotje, het kindje het sleuteltje.